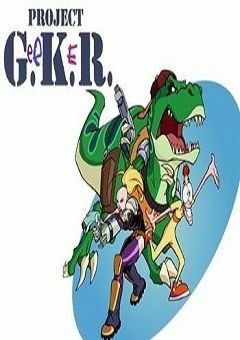 Set in the future, the show was based around a genetic shapeshifter experiment known as Project GKR (Geno-Kinetic Research), who had been stolen by Lady MacBeth (a short-tempered cyborg with a bionic arm) before he could get the programming he needed to be a deadly and powerful weapon at the hands of the evil Mister Moloch, head of Moloch Industries. Due to the lack of his final programming, “Geeker” is left to be a totally random, permanently salivating, four-fingered klutz. He only occasionally manages to use his powers to any full extent, a blessing and a threat to his friends and their enemies. Lady MacBeth and her partner-in-crime Noah, a green, baseball cap wearing intelligent Tyrannosaurus rex, must now prevent Moloch and Geeker’s creator Dr. Maston from ever obtaining Geeker at all costs.